The Detroit Lions and Ndamukong Suh have been informed that the defensive tackle will be suspended for this weekend's wild-card playoff game against the Dallas Cowboys. If Suh's appeal is denied, it would mean Detroit would be without both of its first-round defensive tackle selections. Coach Jim Caldwell said Monday it would take "a miracle" for defensive tackle Nick Fairley to play against the Cowboys. Fairley has not played or practiced since injuring his knee against Atlanta in Week 8. 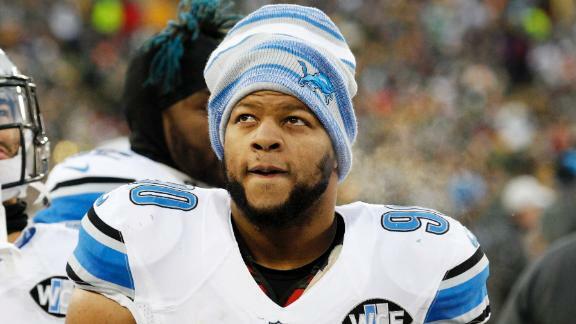 If neither Suh nor Fairley is available, the Lions likely would start C.J. Mosley and Andre Fluellen or Jason Jones at the defensive tackle spots. This isn't the first time Suh has had issues with Green Bay. He was suspended for two games in 2011 after stomping on the arm of then-Packers center Evan Dietrich-Smith. Suh was also fined $100,000 last season for an illegal low block on Minnesota center John Sullivan. He has been fined for roughing up Cincinnati's Andy Dalton, Chicago's Jay Cutler, then-Houston quarterback Matt Schaub and then-Cleveland quarterbacks Jake Delhomme and Brandon Weeden. If Suh is not allowed to play in Sunday's game and the Lions lose, it could be the end of the defensive star's time in Detroit as he is set to become a free agent at season's end. Information from ESPN's Chris Mortensen and ESPN.com's Detroit Lions reporter Michael Rothstein contributed to this report.